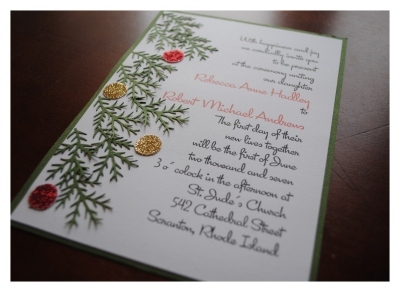 These unique Christmas wedding invitations are great for any holiday or Christmas wedding. I made these invitations using pretty much just a simple paper punch. I happened to get my hands on a pine needle paper punch and the first thing that came to mind was to make winter or holiday wedding invitations. You could change this invite to match a winter theme by simply sprinkling white glitter or chunky white "sugar coating" glitter to the top of the "branches", sans Christmas bulb ornaments. 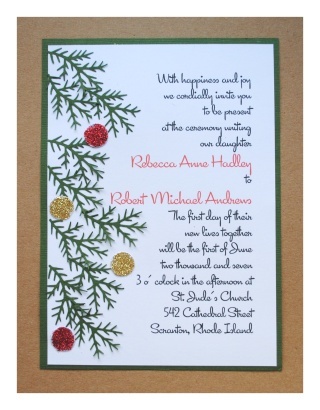 The base of these holiday wedding invitations is basically two cardstock pieces attached together. I printed the wording onto regular 90lb. plain white 8 1/2" by 11" cardstock. I always like to print the wording two per single piece of paper so I can simply cut the paper in half and trim it down to size. 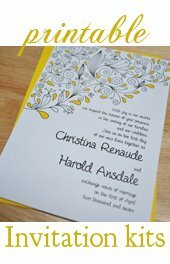 You can use our free invitation template to print your wording 2 per page. It also has some easy cutting guides to use to cut the paper down to 5" by 7". I used some Bazzil Basics textured green cardstock to cut down to a 5" by 7" backing. I cut the white cardstock just a tad bit smaller than the backing (doesn't have to be rocket science - use your best judgement. Some like a larger border of color while others may like just a little hint). I attached the two cardstock papers together using a permanent adhesive glue runner, and centered the pieces as best I could. Using the same colored cardstock I then went to work punching out a TON of pine branch pieces using my paper punch. I will not sugar coat it for you - this part is tough. You need to use some muscle to punch over and over again, especially through cardstock. You can make it a great deal easier on yourself by using a thinner paper, or even some green vellum would have an interesting effect. But I just HAD to make it perfect and use the tough paper! After punching them all out the idea is to arrange them on the face of the card sort of like Christmas tree branches peaking out into the Christmas wedding invitations. I find it always works best to arrange them ahead of time and figure out how you want them to look. You will want to flip some of them over so they are not all facing the same direction. This will add some depth and interest. After you figure out how you want them arranged then you can start glueing them one by one. I actually glued them on only at the stem so that the ends of the "branches" were loose on the page. Adss even more depth and interest! To make the ornaments for the holiday wedding invitations I simply punched out some circle shapes with a paper punch and painted the backs of them with craft glue. I used a paper plate for this part as it can get pretty messy. After painting the glue on I sprinkled on some colored glitter. Make sure and pour it on kind of thick! You don't want the paper to show through! After letting them dry for a while I used a set of tweezers to pick them up and glue them to the front of the Christmas wedding invitations. * For a little added color and interest try adding one more layer to the base of the card. In between the two cardstock pieces slide in a decorative Christmas or holiday/winter theme paper. 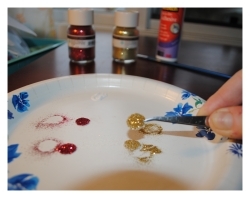 * Instead of glitter try using metallic paper or a decorative print paper to punch the Christmas tree ornaments from. This will eliminate the need for glitter and glue making for a easier and less messy project. 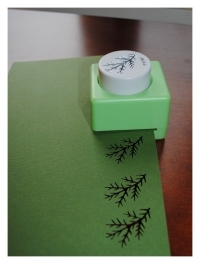 * Punch the pine branches form green construction paper or green vellum instead of cardstock. It will make it easier to punch AND will bring different visual effects.